Last month while I was visiting my sister-in-law, my 4-month old had a “blowout.” I asked my sister-in-law if she had a stain remover I could spray on the clothes. She mentioned that she had a homemade pre-wash stain remover that did a great job of getting stains out. I tried it, and it worked better than the store-bought stain removers! And it’s so simple to put together. Place the three ingredients in a spray bottle and label. Apply to a difficult stain as soon as it is made and let sit for about 10 minutes before the article is laundered. 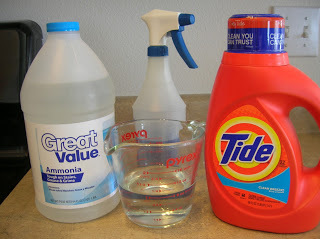 And here’s another simple pre-wash stain remover with ingredients you probably have around your house. Do you have a homemade pre-wash stain remover that has worked for you, please share it with us. Is this pre-wash good on most any regular fabric and colors? Yes, it is. I spray it onto all of my family’s clothing that got something on it that could stain.